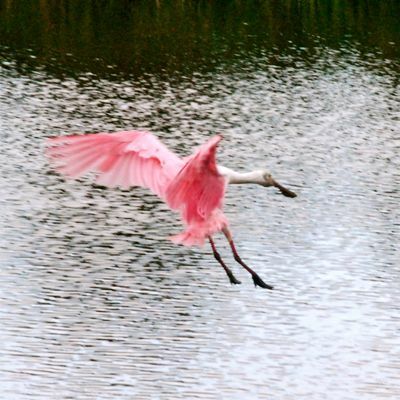 Roseate spoonbill, photographed at Green Cay Nature Center, Boynton Beach, Palm Beach County. Yes, this is one of the most spectacular birds gracing the skies of South Florida. No, it's not a flamingo, despite the pink feathers. Nothing really beats seeing a roseate spoonbill, Platalea ajaja, in flight, with its deep reds and pinks, except perhaps seeing one in flight as the sun begins its descent. Now factor in that it's a really, really big bird and that really, really strange spoon-shaped bill. 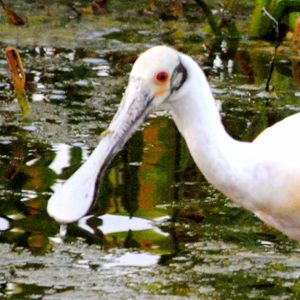 The famed birder Roger Tory Peterson called the spoonbill “one of the most breathtaking of the world’s weirdest birds.” We haven't seen that many truly weird birds to comment beyond agreeing with the breathtaking part. 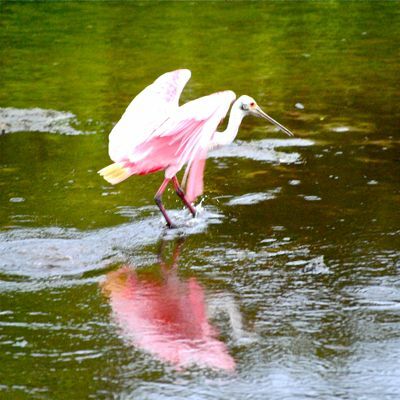 We made a point of saying that this is not a flamingo, because so many tourists see a pink bird in Florida and assume it's inspiration for lawn art. The bill tells you it's not, of course. 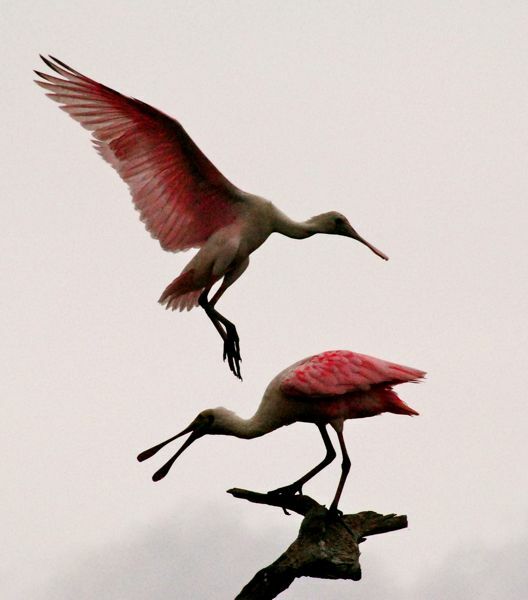 The roseate spoonbill is a bit of a mystery. 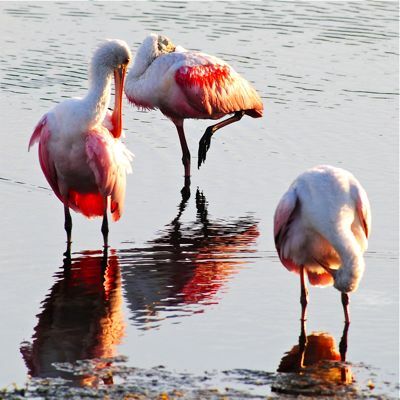 They are fairly common in South Florida's wetlands; Green Cay Nature Center and Wakodahatchee Wetlands are particularly good spots to catch them. At certain times, we'll see dozens of them, roosting on snags or wading in the shallows for food. Then they disappear save perhaps for an occasional individual or two. Where they go, we're not sure. Perhaps into Loxahatchee National Wildlife Refuge or maybe Lake Okeechobee. 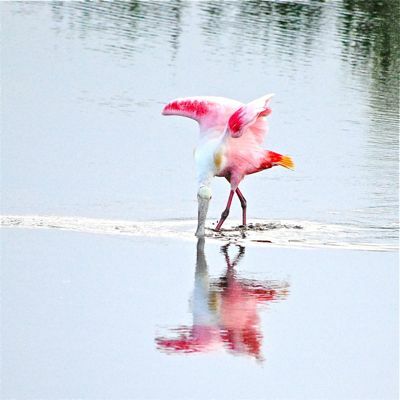 As we said, roseate spoonbills are fairly large, with a body length that approaches three feet and a wingspan of four feet or more. 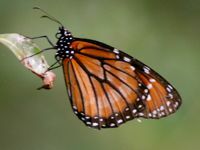 Females will lay clutches of two or three eggs, usually; both parents incubate the eggs and both help feed the offspring. 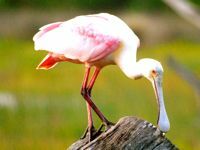 Young spoonbills are able to walk about their nest and adjoining tree limbs after five or six weeks; they can fly after seven or eight. 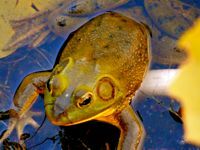 Their diet includes small fish, shrimp, crabs snails and aquatic insects they gather as they move their bills through the water side to side in a sweeping motion. 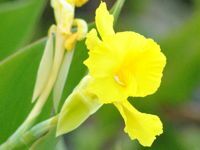 Their range extends along coastal areas of South Florida and parts of Texas and Louisiana, into Mexico, Central America and South America. 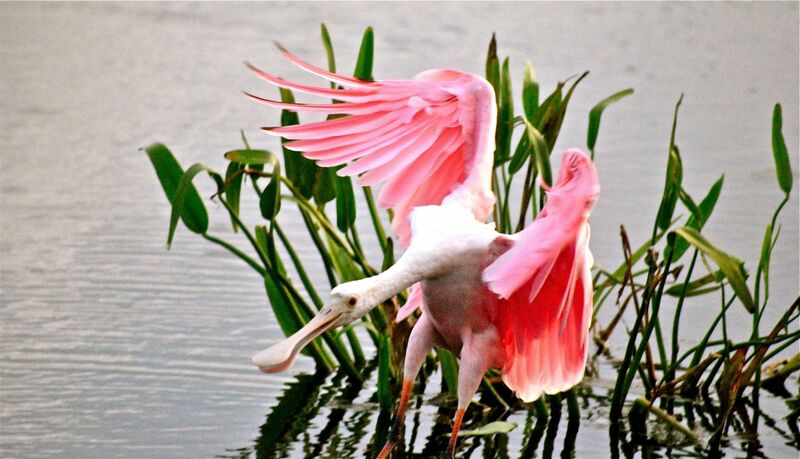 Not surprisingly, during the 19th century, roseate spoonbills became a target of the fashion industry, hunted to near extinction in the United States. 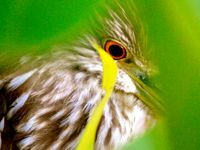 The bird rebounded in the 20th century to the point where the International Union for Conservation of Nature lists now classifies it as of "least concern." 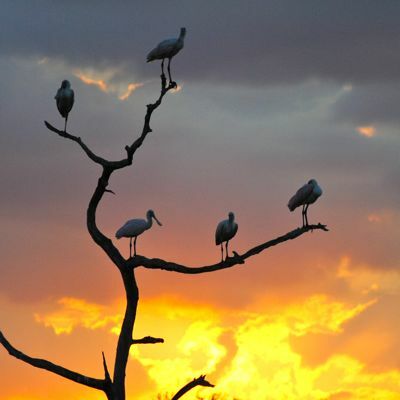 Still, there's evidence suggesting that their numbers are declining in extreme South Florida, most likely because of the east-west diversion of water that would normally flow south through the Everglades into Florida Bay. 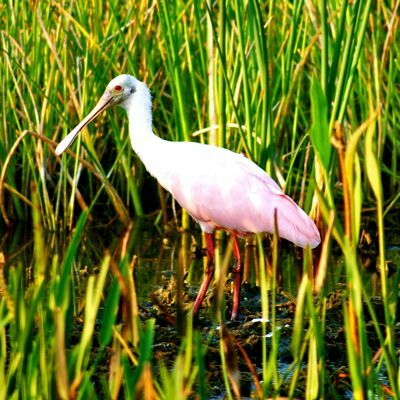 Diverting the water — and the timing of the diversions — can affect both the depth of the water at critical times and the quality of the water and its ability to support the fish spoonbills feed on. 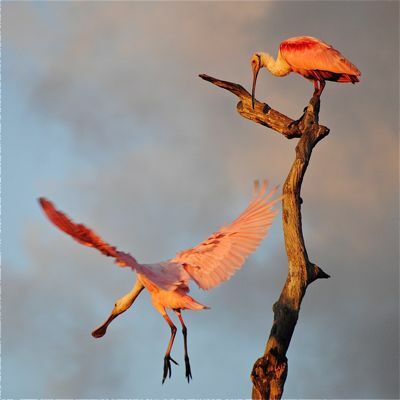 Roseate spoonbills are a year-round residents of South Florida. 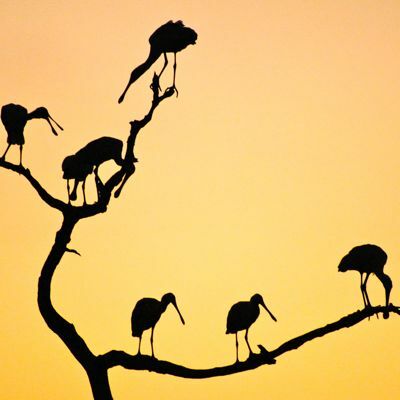 They are members of Threskiornitidae, the spoonbill and ibis family.